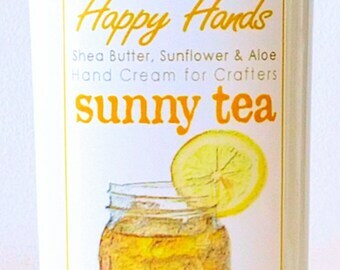 I hand-blend my Happy Hands paraben-free hand cream with shea butter, sunflower oil and aloe vera, especially for knitters, crocheters, spinners & other fiber artists and crafters. It's not greasy or sticky, and will not transfer to your handiwork, I promise. I offer 32 unique scents (vivid, mild or light) plus Unscented fragrance-free... and I include a free sample packet with every order so you can try new fragrances. 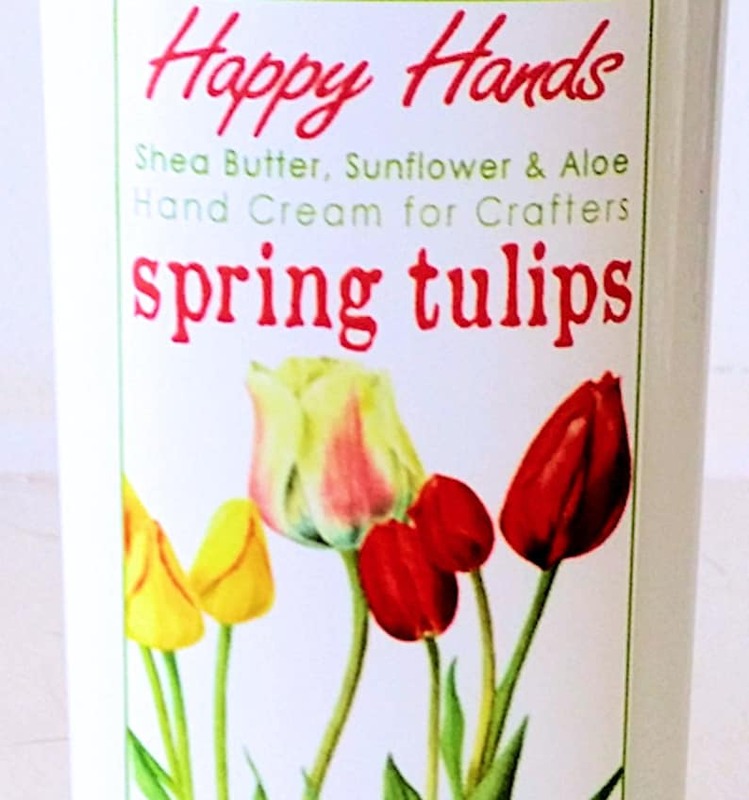 My "Spring Tulips" scented hand cream is a deliciously clean, green floral - not perfume-y! - like a luxurious breath of freshly-cut flowers. 1-ounce Tottle : Cute & refillable, pocket sized. Great party favors! 3” tall, $3.50. 2-ounce Travel : TSA approved size for airline carry-on, 4-1/4" tall, $6. 4-ounce Medium : Perfect for your knitting bag, 5-1/2" tall, $9. 8-ounce Jumbo : Volume *and* shipping discount saves 25%, ideal for refilling smaller bottles. 7" tall, $16. USA: First Class mail with tracking, usual delivery time 3-4 business days. Orders over 1 pound automatically upgraded to Priority shipping. International: First Class International mail, usual delivery time 10-14 business days. I'll work with you to optimize the international shipping tiers. Try any of my Happy Hands scents in your free sample with order, or my trial size Sampler Sets: 8 assorted scents (or all 32 scents in my Super Sampler), sealed in 1/4-ounce oxygen-proof foil packets. You can choose from my themed sets, or request your own custom sampler. A great way to choose your favorite Happy Hands fragrance, and they make super-cute gifts, stocking stuffers & party favors! I originally formulated Happy Hands for myself, after I tried -- and failed -- to find a commercial product that worked for me. Up here in the high mountain desert of New Mexico, dry hands are a year-round problem. I needed a creamy lotion that would deeply moisturize & soften my hands, but absorb quickly and NOT leave a greasy or sticky residue on my hands that would transfer to my knitting. And of course, it had to smell wonderful! It took me a year to work out this formula: a lotion that is so very thick and creamy so you only need a small dollop, quickly absorbed, nourishing and moisturizing with no residue; and glossy pure white, because I don't add any artificial colors.